Like their Lincoln Center neighbors, The Metropolitan Opera took full advantage of the holiday season with lighter programming. Along with Hansel, Gretel, a Merry Widow and the puppet-populated cast of “The Magic Flute” was the household of “Le Nozze di Figaro” (“The Marriage of Figaro”) performed before a sold-out audience on December 29. 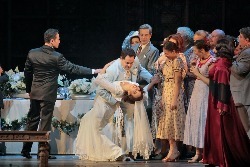 Mozart’s celebration of love needs no holiday to revel in Ildar Abdrazakov’s Figaro, Nadine Sierra as his bride Susanna, or Isabel Leonard as love-struck teen Cherubino, but deserves a better production. Sir Richard Eyre’s displaces the opera from the eighteenth century to 1930s Seville. Mozart and librettist Lorenzo Da Ponte retained the contemporary era of Pierre Beaumarchais’s censored 1781 play. Modernizing “Figaro” doesn’t work because the inferred, rising tensions between the ruling and working classes soon to culminate with The French Revolution run through it. Beaumarchais’s questioning of authority made plausible the “Droit du seigneur” (“Lord’s right”) claim the servant Figaro’s employer Count Almaviva (Mariusz Kwiecien) evokes regarding the couple’s wedding night because of his infatuation with Susanna, his wife Countess Rosina’s (Ailyn Pérez) maid. Eyre further ignores the glaring historical fact that his 2014 production falls either before or during The Spanish Civil War. Due to their own censorship issues, Mozart and Da Ponte eliminated direct political references. Therefore, setting it during that extremely violent time without an opportunity of referring to it does not make sense – except to dress the cast in Rob Howell’s chic costumes. When the Count sends Cherubino to his privately financed military unit as punishment for falling in love with the Countess, one assumes he will fight (and die as he eventually does) with Franco’s Fascists, an unsymbolic, a useless fate for a Romantic-era youth willing to “die for love.” Though irritant, it does not detract from Isabel Leonard’s Cherubino. The mezzo-soprano makes a convincing adolescent singing sweetly while causing a lot of trouble. “The Marriage of Figaro’s” events unfold over one day. Regrettably, Rob Howell’s set and Paule Constable’s lighting obliterates Mozart and Da Ponte’s perfect timing. The Almaviva Castle is a rotating iron cutaway set apparently torched by Khaleesi’s dragons. Lighting spotlighted singers rather than emphasizing passing hours of the day. The permanent darkness effected conductor Harry Bicket’s occasionally hesitant timing interrupting the day’s musical and dramatic rhythm. These production choices are frustrating because Eyre makes the characters’ relationships and sub-plots involving contracts, letters, cross-dressing, and mistaken identity very clear. The best example of this is when the Countess introduces herself with the aria “Porgi, amor, qualche ristoro” (“O Love, give me some remedy”). Ailyn Pérez had understandable uncertainty with; the aria is notoriously difficults and there is neither recitative (sung dialogue) nor interaction with other characters before it. Still, she established Rosina as a neglected, unhappy woman, and her voice gained strength during the performance. Mozart’s 1786 opera evokes another kind of timelessness. Baritone Mariusz Kwiecien’s overly aggressively vocal Count was abusive towards Countess Rosina and grabbed at Susanna and the other maids, causing nervous audience laughter. During a normal news cycle, this could be interpreted as how their relationship declined since Beaumarchais’s first play (and Rossini’s opera) in “The Figaro Cycle”, 1775’s “Le Barbier de Séville” (“The Barber of Seville”). Since this is not and the issue is never going away, it appeared Kwiecien capitalized on headlines. Due to censorship, Figaro’s last act aria addressed to the audience (“Tutto è disposto…Aprite un po’quegli occhi”/“Everything is set…Open your eyes”) became a diatribe against women rather than the aristocracy. Music scholars and critics of major publications tend to excuse it, citing…time as an excuse. Discussing it and the many instances in occurs in opera would help opera in general and the Met specifically damage control over their own disturbing #MeToo revelations. Yet, eliminating the aria wouldn’t work because minutes later Susanna voids everything Figaro claims. It is also the bass-baritone’s final aria. Ildar Abdrazakov delivered it convincingly in character, shining a flashlight into the audience looking for answers. Figaro generally outsmarts his boss the Count but sings before he thinks. Abdrazakov is a silly Figaro who never sacrificed his customary careful phrasing and smooth bass-baritonal tone. He is comfortable playing the fool and with acting in general. Because Susanna thinks before she sings, she and Figaro are equals. Nadine Sierra opted to emphasize the maid’s adeptness at handling her fiancé and would-be seducer with humor and common sense. She and Abdrazakov were not only vocally besotted, they are a good dance team. Sierra’s last slow-burning aria, “Giunse alfin il momento” (“The moment finally arrives”), declaring her love for Figaro, was the performance highlight. If someone wanted to discover opera, “The Marriage of Figaro” is one of the best to do so. Each principle, including the small but crucial part of Cherubino’s official steady Barbarina (Ashley Emerson), gets incredible music to sing. Even the instrumental parts like the Overture and Wedding March are both perfect and memorable. There is the wondrous way Mozart has the Count twice beg the Countess’s forgiveness using almost the same words: the difference being the music accompanying the second request concludes the opera beautifully while never resolving their relationship. Those are reasons enough for overlooking this flawed staging. Running time: 3 hours and 21 minutes, with 1 intermission. For tickets and additional information, please click here. Same-day $25 rush tickets for all Le Nozze di Figaro performances are available on a first-come, first-served basis on the Met’s website. For additional information on rush tickets, please click here. © Copyright 2018 by Jeff Myhre, PhD, Editor. No part of this publication may be reproduced without written consent. Produced using Ubuntu Linux.